take some time to drool a bit over these NEW inspiring projects created with the mykonos collection. let all the colors, embellishments and creativity soak into your gypsy soul and then post a comment to vote on your favorite mykonos project - tell us why that project stuck in your mind and what inspires you most about it! yes, we know this will be a tremendously difficult decision, we're sure you love them ALL as much as we do BUT be quick and detailed gypsy- the giveaway is going to be HUGE! If you're one of the lucky winners, we'll send you everything you need to create one of these projects! The artist printers tray combined with the new mykonos collection were perfect for organizing my photos and trinkets from one of last summer's journeys. I love the way the bright colors capture the beautiful blues, greens and vivid splashes of red that I associate with this adventure. Whenever I journey through different parts of the world, I find myself collecting bit and baubles from every place I visit. I enjoy taking a small piece of the places I've visited home with me as evidence of where I've been. This journal is filled with a lot of detail but don't let that keep you from trying on of your own. Simply start by binding the mykonos book cover and journal pages together with the binderie punch and binding rings. That will give you an instant album to start with. I finished off mine by adding the brightly colored gypsy envelopes and then filled it lots of detail with my favorite embellishments. It's was one of the funnest vacation journals I've made! What I love most about this layout is the juxtaposition of collage and art journaling against bright colors and heavy patterns. Most often, when I think collage I go for vintage, nostalgic finds in muted colors. I enjoyed working with the mykonos collection to pull this together because it is playful and fun and works so well with vacation and sunny day photos. I didn't expect something like this from 7gypsies, but I am thrilled that they delivered! I've had this acrylic album in my gypsy stash for a few months now. I wasn't really sure how to embellish it but also play up the transparent acrylic~ until I saw the mykonos collection. I knew that the summery, ocean inspired colors would work against the clear acrylic. The combination reminded me of water, cruising, trips to the beach, sailing on the ocean... you get the idea. I wanted to use the acrylic to create layers of dimension so that you could look all the way through the book to the very last page. One of the funnest aspects of acrylic is that you can create a lot of layers by adhering things to the top and back surface of each page for extra ooomph. This is something you've gotta try! Lately I've been experimenting with watercolors. It's been a fun process with lots of mixed results! I've been cutting down my watercolors to make cards that fit in my library drawer. Each day I pull a card and write an inspiration or affirmation to a card. I found that mykonos compliments the vivid colors that i've been drawn to paint with and have been the papers to add something fun to each card as I go. Sooooo, take a second to post your vote for your favorite Mykonos project, be sure to tell us why it inspires you and we'll post the winners next week! Happy posting gypsies! mini album on the display. I love seeing the projects as art pieces. I find it inspires and makes me smile just to look at all the bits hanging off....now to add a trip to Greece to my bucket list. Oh my god, if I could win the products to create the Sweet Life Album I would be over the top happy. When I was looking at it I thought "What a perfect opportunity to scrapbook ME - something I have yet to do. Sande's album just blew me away and I was ready to order everything on the product list and scraplift my hands off! What a great opportunity to scrap my hands off without breaking the bank. Love the Cruise Summer Vacation project! What a great way to document vacations, graduations, family, friends, etc. I don't know these are all crazy good projects but if I have to pick one, it would be the Sweet Journal Life, I cannot wait to get my hands on this collection! They're all wonderful but I really like the sweet life journal; it can be used to collect those tidbits you want to remember and be remembered by. I love mini albums!!!! All the projects are fabulous! My favorite is the Sweet Life Journal. Would love to make one of my own for a summer trip we're planning to Arizona/Utah this summer! I love them all, but I'd most likely recreate the journal. My family and I take trips every year and I love that I could take the journal align and work on the mini album throughout the vacation. We have all boys around here so the bright colors will compliment all the boyish colors they wear (in photos). I love having reasons to use my bindery punch- such a cool tool! Great collection Gypsies! I am loving the Sweet Life journal. So many details and layers. What a great way to document a summer or vacation. This collection is the inspiration I need to tackle a project like this! My favorite would have to be the Sweet Life Journal. I am so excited for this collection as I am taking a trip to Greece this summer! This could not have come at a better time for me.... I'm over the moon! Thanks for the opportunity, love your stuff! I love the journal. I am totally into mini albums and journals now. Love the colors; love the collection! All of the projects are super but I love mini books so that gets my vote. I wish I was going to Greece! I love journals of all kinds. The Sun=Fun mini album is fantastic!!! I love the colors of this collection though, so trying to select just 1 favorite was darn near impossible!!! I have to vote for 2- the acrylic album would be something wonderful to look at everyday but the journal would be something you'd actually want to write in everyday- they're both so colorful and fun! i love the sweet life journal/album. i could see myself filling that up with all kinds of goodnes! These are all great projects but my favorite has to be the printer's tray. I love the way you focused on the beautiful photos and also, it shows this collection's versatility! I'd love to go to Mykonos, but until I do, I can still play with this gorgeous collection using fun summer photos! Thanks for the inspiration! I love the library drawer of inspiration. The Mykonos collection looks like it makes each piece in the drawer a little treasure to explore. The Be True drawer one. I love being able to sort thru it and arrange it - like portable mini art journal pages. I also have a small journal of collected quotes that I would love to use with it. I have an art class that would spend forever just looking thru it and they'd even want to add their own cards to it! All of the projects are amazing.. from the layouts to the tray.. then the mini and on. I must say the mini did catch my eye but, the drawer... ahh.. now that is me! I have been itching to play with a drawer for ages and this one totally rocks! This would be an amazing way to start your day looking at encouraging thoughts and quotes in such vivid, lively colors from this collection! WOW fantastic projects and they all are fabulous but my favorite is 'The Sweet Life' album. I love to create and (hopefully) inspire others to do the same. This album would be perfect to catalog our monthy family adventures (from camping to just a walk in the park). Thank you! sun=fun! acrylic album...even the name speaks to me. So much dimension! I am a sucker for journals, so The Sweet Life holds great appeal for me! Love the look! Wow, way too hard to decide which one I liked best...but I have to say The Sweet Life Journal. The design was just amazing of course all the colors were just beautiful! Thanks so much for the chance to win. Pick just one??? i love them all, but my fav is the sweet life journal. I love making wonderful journals with hidden surprises!! i love the sweet life album - it is awesome! I love this new line - it is so summer!!! I am going to have to go with the sun=fun album. Wow! But in all seriousness, they are all gorgeous. I love this line, another one out of the park! i love the vacation tray. so very colorful makes me want to use more color in my projects! wow....just one huh? it's between the amazing sweet life journal and the drawer of daily inspirations. what a beautiful way to document life!!!! Oh my gosh what a hard decision!!! I'm gonna have to go with the tray for my pick though...gorgeous work! I think my favorite is the drawer of daily inspirations!!! So inspiring!!! Love it! The other creations are amazing too! I would like to adapt the drawer et store the cards I have to post all along the year and make separations by months (hope you can understand, my english is not very good). the SWEET LIFE JOURNAL is my fave! thanks for sharin such gret projects and thanks for the chance to win some goodies! My fav is 'be true' a drawer of daily inspirations! Love all of the mixed media and doodling. The fact that all those bright colors and fun are housed in a solid dark wood drawer is figurative for the life of a gypsy-- one's life should be filled with fun and happiness, yet also grounded on a solid foundation! Thank you for sharing all of these gorgeous projects- truely inspiring! I love the artists tray - I totally want to do a project like that to hang in my home! I love the drawer of inspiration. Perfect to have on show all the time, to choose a card to take out and see, a different one every time! What a tough decision - these are all great projects! Since I'm forced to choose, my favorite is definitely the Sweet Life album. I love journals and in particular, I love the way this person journaled about various experiences in her life throughout the year. And I love all of the bright colors and patterns of this collection. Thanks for the giveaway! Oh my goodness! I love your SWEET LIFE JOURNAL it is so stunningly beautiful. It is exactly they way I want to create albums but I just have not bumped up my craftiness their yet. I plan to. The Cruising through summer vacation tray is my favorite. I would like to create this and use this type of 'art' to decorate our home. Wait, my favorite is actually the Daily Drawer of inspirations. This is personal and reflective. I'd like to create this to sit in our home for others to see and add to. I will vote for the drawer love the wood and you can get a lot of stuff in it more than a album. I love all the projects but the drawer of inspiration is my fave. I like the style of the design, the bright colors and the flexibility of being able to continue to add to the project. First of all I must say that I love the colors of this collection. Anything red, yellow and blue just screams happy to me. I love the drawer with cards. I love making cards and love the idea of making some ahead and writing sweet sentiments inside. My favorite project is the "be true...a drawer of daily of inspirations" because it is so much fun--full of life, movement, interest and creativity. Thanks for the chance to win. Love, love, love the Sweet Life album and the library drawer. Really, anything 7g gets my vote!! I do love anything 7 Gypsie, however if I have to choose one project it would be the artist tray, I love how each square tells a story. I love to hang them on my wall and it always takes me back to the moment in time when the photograph was taken! Bravo to 7 Gypsie! I really like the Sun=Fun Acrylic Album. It has tons of depth and character. I especially like the little dangling bottle that has "Souvenirs: more junk" on it. 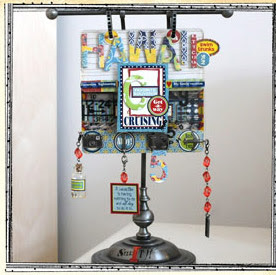 I'm a huge fan of 7Gypsies products so its very hard for me to pick just one project. I make a ton of mini albums so I'm going with the Sweet Life Journal. Its been a dream of mine to visit Greece so the new Mykonos products are a must have for me! I've ordered one of everything from this release. Oh boy, this is tough. I love them all but I really love the drawer. I have loved this product since I say it and really want to get one. I love the daily inspirations and adventures idea. Thanks for sharing with us. I love being a gypsy! The fun acrylic album is my winner. It's a very unique display and one that I have not attempted and therefore it gets my vote! The sweet life journal definitely. I love mini journals bc they are the easiest way to capture your memories for a specific trip or season or event. All of the projects are clever, creative and I can see how each can be used for so many different purposes...but I really love the "be true...a drawer of daily of inspirations." Again, soooooo many possibilities and what a fun way to start each day! I had started a project for a friend's birthday present, but I'm putting it aside and doing something along the lines of this creative, fun and amazing project! I can always rely on you Gypsy Queens for inspiration! WOW! Very nice creative projects. My favorite is the Sweet Life Journal...how cool does that look...and pratical too! Love, love, love the vacation tray. Thank you for the chance of winning big! Oh my....do I really, truly have to pick just one? Oy. OK, then, I have to go with the drawer of daily of inspirations. It's just too lovely, and having all those different pages would be awesome. Well done! I absolutely love this collection. My favorite project, although they are all beautiful, is the tray! I must actually admit that the choice is not too difficult - my favourite project here is the Sweet Life Journal! I just have a thing for cute little mini albums... Love all the details! OHHHH....such lovely projects, but I must say the Sweet Life mini album is my fave...love the details, and design, the use of the product, just everything!! I absolutely love the Sweet Life Album. It's amazing and I will definitely use it as inspiration to use the new Mykonos products to creat my own Sweet Life Album! The Sweet Life Album is adorable--this would be an awesome album for all of my gypsy summer adventures! 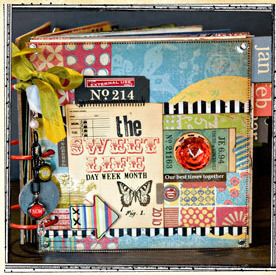 the sweet life album caught my eye - lots of color and texture and tags and journaling spots. little mini albums are a quick trip through time. how to pick? how to pick! how to pick? Sweet Life Album I think is my favourite - at least that's where I would START!!!! hahaha They are all so fantastic! I love the drawer of inspirations! I like the papers and the idea of daily inspirational quotes on the artwork. The colors are fantastic and I would love digging through it. Visually and physically touching the papers and ephemera would be so lovely! I love the Sweet Life Journal, so many different things you can use it for. why? the sweet life would document my life at this point. sweet or not. it's all good. tough choice! they all are so awesome, but I'm a sucker for journals, so I'd have to pick the sweet life journal. so many fun elements to it and I love how sande documented an entire year in hers! TFS!! I'm loving the Sweet Life album. Amazing colorful and such a fantastic way to document a year in the life of your family. It's absolutely beautiful! the sweet life journal is totally my top pick. I love making journals but this one is so colorful. Cruising thru summer vaction is my runner up. The library drawer gets my vote. I've been on the prowl for a drawer at thrift shops that I can use for collaged cards. It's the next gift item I'm making for a crafty, word-wise friend. All of the projects are beautiful, but I like the tray because of its usefulness. It can be displayed for all to see and even used. Impossible to choose! I'll go with the drawer of inspiration - fabulous! Love the summer feel of all the projects. I particulary like the tray with each space having its own number...love the little details. Oh wow --- as soon as I saw the word Mykonos I thought to myself - ooh-la-la - a dream for many years to go there, must have read too many romance books - lol ... it will happen one day. I am totally a layout girl and love the Happiness is.....12 x 12 layout. The colors and details are devine. That Sweet Life Album is too cool....actually they are all wonderful, it was hard to choose! Great colors, textural, made me want to sink my teeth into it! I'm really getting into books lately and that one is wonderfully creative. I really love the library drawer. I would do exactly the same thing! Love the Sweet Life Journal..what a great place to record memories and photos. It is extremely inspirational. If I won, I would be on cloud 9---thanks Gypsy family. I just love the "Sweet Life Journal" ... it speaks to me in a way the other projects do not. That doesn't mean I don't like the other items - I do ... it's just that the journal has a louder voice. Lately I've been making mini albums and can't quite get enough of them. This is a great giveaway - thank you bunches! Love the colors in this collection. This is a place on my to visit list! 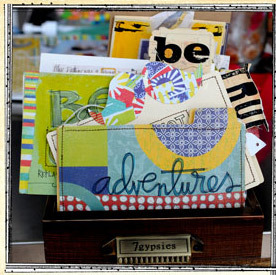 The three projects that I would like to duplicate would be the vacation tray, the journal, and drawer of inspiration. Thanks! Definitely the Sweet Life mini for me! My vote is for the print tray project! It is fabulous. It's totally inspired me, I really want to make this. I may have to buy all my supplies on-line though. No LSS to run to and pick up my 7G's goodies! :( Maybe someday I'll open one myself...wall to wall 7G's, gotta love it! Love the Sweet Life album. Wow, Amazing!!! I love your SWEET LIFE JOURNAL it is so stunningly beautiful. I like all of the projects and I know I will enjoy making them. I need to pick two projects from the lot. I love the summer vacation tray and the sweet life album. I love doings these kind of projects. thank you for this giveaway. I like the printers tray project because it's fun to design in little 3x4 inch capsules and you get to see all your photos at one go. And the bright colours of Mykonos would be perfect for summer photos. So hard to choose just one, but the sun=fun acrylic album has inspired me to try many different techniques. I just love the look and the dangles! Thanks so much for the opportunity to win! I love the Sweet Life Album. It's so bright and full of great ephemera, and I like the idea of creating a mini album to cover one year's travel adventures (rather than just life in general)! Gorgeous! I love the "sun=fun! acrylic album". I have a few acrylic albums that I haven't done anything with you & this just oozes inspiration & I love, love, love the colors in this line! Thanks for sharing!!! love the sun and fun album ! Especially the danglies on it - really cool. Thanks for sharing all the pretty projects and a generous giveaway ! The summer vacation collection tray gets my vote. I love trays and have decorated some too. Great job! The Sweet Life Album is the one for me... <3 it!! I make pages all year but for the holidays I make lots of mini albums. I'm always looking for inspiration for the next mini album. Thanks for the inspiration and an awesome giveaway.. I love the the sweet life journal! I just love books! Thanks for a chance to win! I love the drawer of affirmations...it's so inspiring. The colors of this collection are so bright and vivid and reflect and complement the sentiments of hope and affirmation on the cards. Love them all, but I would pick the Be True Drawer. Love drawer, been wanting to do one for a bit. I really like the inspirations idea and LOVE the new Mykonos collection! The sweet life journal had me at first peek! It is perfection. I want to make a printer's tray SOOO bad! They are such the rage, and look so amazing!! The 7Gypsies version, only makes me want to create one more! The standout for me is the artists tray. Love the fact you could display it anywhere in your house and it will capture attention everytime. Must say the Mykonos collection is quite stunning and can see myself using it LOTS! Definitely the journal. So much detail, such a cool, ongoing project. Every day it becomes something new. Love it! My favorite is the Sweet Life Journal. I am a huge fan of 7 Gypsies products and I absolutely love how they were utilized in this book to commemorate a year of fun, andventure,accomplishment and love! I love all the interactive parts and the Mykynos color palette is one that lends itself beautifully to almost any project that I could ever want to make. Hard to choose, I would say right off the the journal, but I love the daily inspiration also. I love the Sweet Life Journal, especially since the pages and cover start out as pre-prints that can be quickly embellished. What a great cheerful collection this new release is... would love to win! It was so hard to chose from all the wonderful projects, but the "Drawer of Inspiration" definitely grabbed my attention. The name alone says it...it is such treasure and a work of art! I love the Sweet Life Journal. It is amazing how she took her embellishments and created such a work of art! I am very intriqued at how easy she said it was to put this journal together. quote.."binding the mykonos book cover and journal pages together with the binderie punch and binding rings. That will give you an instant album to start with"
It sounds like..even I could do that! I have always wanted to do a journal but never got the courage to do it. Now...I think I will! OMG! How can I pick ONE?? Since I have to pick one to win...I choose..."Cruising through summer vacation collection tray". The main reason this caught my eye was that we just went on our first cruise in February. This would make the PERFECT home decor project to show off my favorite photos of the trip. Who could ask for a better idea than that! I love the drawer of daily inspiration!! I want to make that, it has totally inspired me---its doable ton's of neat little things I can do. I can do it!! Love your products so much!!! Sue I.
I have to say the printers tray really makes me want to run out and start scrappin'! I love the look of it, the colors and the placement of photos is great. I've been to Mykonos and the thing that really struck me was the whitewashed streets. And then there were these flashes of color from the store and stalls. I loved the windmills and the pelicans and the hot, gooy crepes were bought as we wound around the little streets. The printers tray is like that, white path with pops of color and sweet memories around every corner. I LOVE all the projects but the drawer of inspirations is phenomenal! I'm so into ways to remind myself how sweet life is and how lucky I am. What a perfect way to do just that! My favorite is the Sweet Life Journal! I love that it was arranged by months with highlights of all the activities. The bright colors are so inviting and lend a bit of excitement to each page. I think this would be a fab idea for a summer journal-then everytime you looked at it you would feel that summer flavor! I simply love the Sweet Life Album! It´s always a pleasure to document important events throughout the year, and this collection works great for that! Hands down "the sweet life album"
This album stands out the minute you look at it. Fabulous design, colors, knob. This could be used for many things. Jounal every month about your family, yourself, child, baby......LOVE IT! How I love little books and journals! The "sweet life" journal would be so cool to win....thanks 7Gypsies van for bringing us these amazing vivid colours out of Mykonos in that special Gypsy style that continually inspires me....I LOVE ALL things Gypsy. I love the be true- daily inspiration. this is awesome and I could incorporate some of the sayings daily that I would love to see on a continuous basis!!! Thank you for a great idea and opportunity to win!!! You all keep up the inspiring great work! This is a tough call - all the projects are wonderful! Iam going to haves to go with the beautiful tray - it had me from the C is for Cruise! I have almost all of your themed sticker collections and I've used them on some of my most treasured pages and projects. I love the Cruisin Through Summer Vacation Tray. I love the tray itself -so versatile!-and the Mykonos Collection is so vivid and just screams summer! (This was a hard one, though, since all the projects are fabulous! Choose a favorite??? They are all stinkin' cute but the best is the Inspiration drawer~~ How great that would be to put down on paper a daily thought, blessing or memory~~~ a wonderful concept and one I would be "over the moon" happy to wrap up each day with. Awesome product and thanks for the chance to win me some & Gypsies Goodness!! OMG!! I love the colors on this collection and for this reason it is so hard to have just one favorite. All the projects are beautiful but I love the mini album. I think the colors showcase the best on that and I can truthly see myselft doing that mini. Congrats you have a very talented team. All the projects are amazing! Wow, those Mykonos Projects are so beautiful. I love the sweet life journal! When I'm travlling I always make a travel journal myself, so your journal is nice inspiration for me. They are all great projects. I am torn between the vacation collection tray & the drawer of daily inspiration. Forced to choose I will go with the drawer because I'm just drawn to it. I love the idea behind the project & that drawer is to die for. i loved everything on every project, so fabulous. how fun to be able to even think of winning some of this great paper, etc......and i could even scrap some of my pictures from mykonos and rhodes! yay! So love The sweet life journsl it has inspired myself to start my own journal about our own hoilday trips we have taken the colours in this collection are just divine think i will be making more than 1 albumt thanks for the mojo just what i have been needing for some time! I like the printers tray the most. Each and every compartment is colorful and unique. I love this new collection. I would love to win some beautiful stuff! it is so hard to pick just one... i think i am going to try and make teh drawer full of inspiration - it is super cute! I like the Sun=Fun Acrylic album. I like that you have to think ahead while you're creating this so that the pages to come peek through. My vote goes to the "Sweet Life Journal". The cover of this journal catches my eye because of the variety of typography used, of the variety of colors chosen, of the nice layout of many different little pieces. Like a quilt this journl cover inspires me to make a journal of my happy moments. I really love the quilt like fell of this piece. Everything say's "sweet life" in this paper collection. Pick 1? Oh man, they are all gorgeous!!! Absolutely love the Sweet Life Journal! I have to have the new Mykonos line. I went there when I was 16 and have never scrapbooked the photos from the trip. This line is of course perfect for it!!! I love those Printer's Trays, so any project using that catches my eye. The Mykonos line makes it that much better! Having the library drawer sitting on a shelf in my art room, I love the "drawer of daily inspriations" and now have the inspiration to start my version. Thank you for sharing ideas and the opportunity for winning! Happiness is - grabbed my attention first so I'm sticking with it! These are all great projects but my favorite has to be the printer's tray. This collection has the most versatility! I'd love to go to Mykonos, but until I do, I can still play with this gorgeous collection to show case my photo's as your team has here. Wow ... so much good inspiration! The project that sticks in my mind though is the 'drawer of daily inspiration' ... I love how the mykonos collection makes this look so fun with it's vivid colours. I think what caught my eye most is the quotes which affirm my word of the year 'live' ... and I guess 7gypsies and the mykonos collection represents all that 'live' means to me. I love your sun=fun! acrylic album, with all its chunky dangliness! I've always wanted to do a Tray, and this one is fun, funky and gorgeous! "Sweat life journal" is my absolutely favourite!!! I saw the images on the flickr and I looked at it many times. Again and again. It is absolutely fabulous! So many details! I love handwriting and journaling. I like the sweet life journal - very cute and fun idea! Tough to choose.... They are all so beautiful - but I must choose one - hmmm the life's sweet journal or the drawer???? I'll go for Life's sweet journal because I think it's a fabulous way to "easily" store your favorite memories for the year and the new set is just perfect for each month!!! Crusing through summer vacation collection tray! What a wonderful tribute to a gradute or just to document all the summer happenings! I love the sweet life mini album! All of them are inspiring, though. Congrats! oh, it's so hard to pick just one! All of the projects are amazing with this gorgeous new collection but if i have to pick just one it would be the tray. I love all of the minute details on this project and it is a stunning way to showcase photos from a special time or trip. Wow love the bright summery colours of all of them but would say that the tray has got me thinking of lots of possibilities. Love the layout for all those summer/holiday photos especially as we are heading into winter. The project that inspires me the most is the Sweet Life Album! I'm going to be planning my first trip oversees and I would love to put this together before we go. I'm going to start looking for each of the items Sande used so I can scraplift her album! I've been a HUGE FAN of the Gypsies and Sande for a long time! I just LOVE the tray. It's perfection! Thanks for the chance to win! what wonderful projects! if had to pick one i'll choose the sweet life journal, or wait, maybe the drawer, wow, it's hard to choose. it's a great collection! I love, love, love the Sweet Life Album! I love the idea of an on going journal for all the Gyspy Trips I have taken and those I have yet to take. Mykonos is on my bucket list. Sandy did an amazing job on this journal. I love the Colors of this new Collection. They remind me of my favorite time of year... Summertime and have me dreaming of the open road. A GYPSY life for me!! I love the Sun mini album! It is so pretty! They are all great projects, thanks for sharing the inspiration! I am always inspired by 7 Gypsies products. 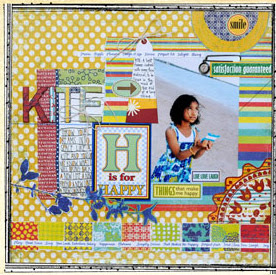 The Happiness layout, "Kite" made me happy. The different products all worked together and stood out. I always spend too much time trying to make things "match" but these match with no problem. So love The Sweet Life Album! Would love to win the products to make that little book! My vote is for the artist' printer's tray! I love the fact that small trinkets and baubles can be added to it because of the dimension. I liked the sun=fun album with all the dangling embellishments. The collection is very colorful and vibrant. I like The Sweet Life Journal most of all, but these are all SWEET projects! Love all the lively colors! All of the projects are gorgeous but my vote is for the Sweet Life Journal. But again, they're all so beautiful! Not fair! All of these projects are AMAZING. If I have to choose just one it would be a drawer of daily inspiration. I'm thinking what a great way to start your day.